Thanks! I'm excited to have you guys! I think you are going to dig it. It's going to feel the same and different all at once. One of the things that I think will be an overall refinement is that dining times will be nearly cut by a 1/4 to a 1/3 of the time. 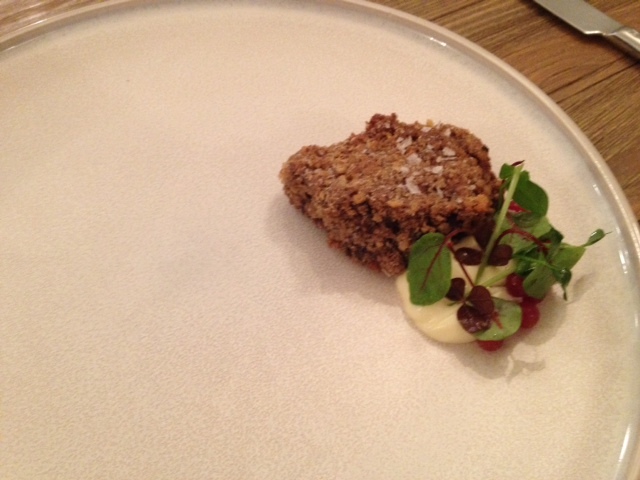 Had a really fantastic meal last night at Elizabeth, with their deer menu. 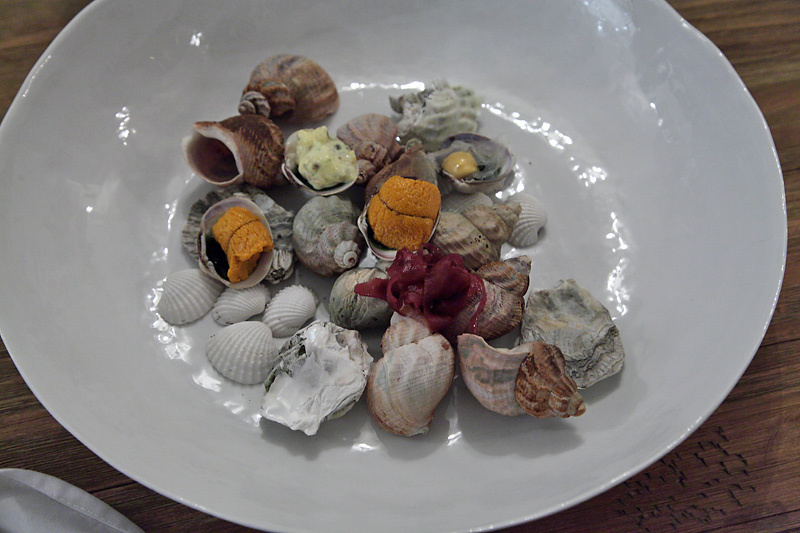 In contrast to my last experience, where the meal was far too salty, this time not a single course was oversalted. I'm really glad I gave Elizabeth another chance and now I'm excited to see what the summer menu has in store. Particularly with the new one menu format. 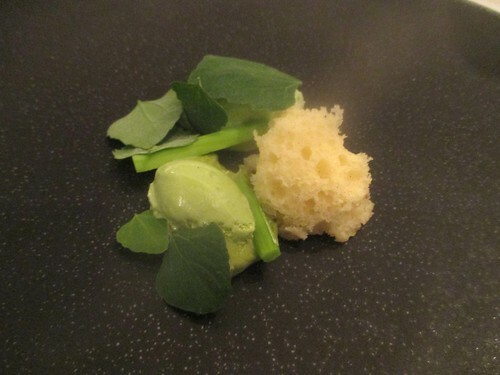 Although it's too late for anyone to experience the spring menu (unless you go tonight!) some of my favorite courses from Deer include the cattails, aspragus, cucumber, yogurt and dried sturgeon course, which was as tasty as it was beautiful. The buttermilk biscuits course with housemade butters, ricotta cheese and rhubarb jam was surprisingly delicious and memorable for me. The biscuits themselves really stood alone as some of the yummiest I've ever had, soft and flaky on the inside with rich buttermilk flavor, and a delicately crisp exterior. All of the spreads were delicious and the radishes had not a hint of bitterness. 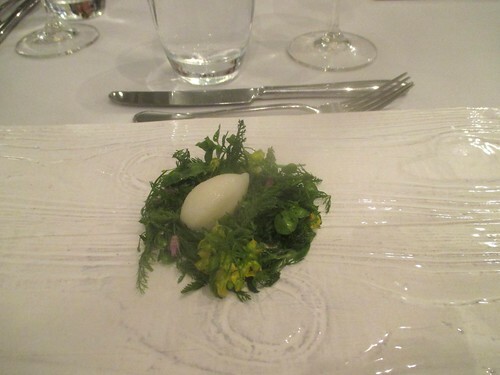 I also enjoyed the dandelion curd (now that's something I've never tried before! 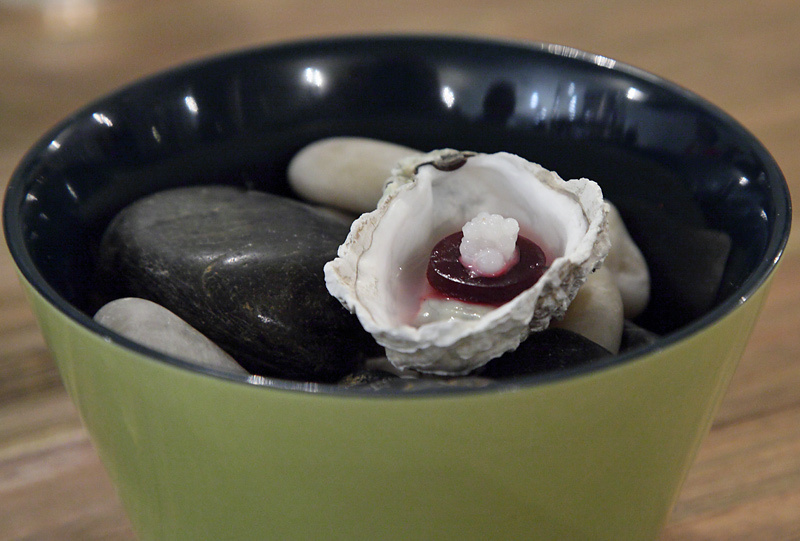 ), pistachio and kusshi oyster on the rock. And with the deer menu, I finally got to try the coveted chocolate dessert that I saw last time. The earthy mushroom flavor, with candy cap mushroom brownies and porcini mushroom caramel was really spectacular, particularly when contrasted with cherries and hazelnut. The little mushroom meringues were adorable as well, and Iliana warned us that if we saw similar mushrooms in the wild, not to eat them since they are poisonous. This dessert, like many of the courses preceding it, reminded me of a miniature fantasy landscape that little Candyland fairies might play in. I enjoyed the wine pairings much more this time as well and I think that is probably due to the food not being so salty, so the wine and food were better able to enhance one another. I guess even great restaurants do have off-nights, but I think I got a true taste of Elizabeth last night and I can understand why so many people rave about it. Iliana did mention that many of her classic courses won't be on the new summer menu, since she wants to push her and her team outside of their comfort zone. Hurdler4eva wrote: And with the deer menu, I finally got to try the coveted chocolate dessert that I saw last time. The earthy mushroom flavor, with candy cap mushroom brownies and porcini mushroom caramel was really spectacular, particularly when contrasted with cherries and hazelnut. The little mushroom meringues were adorable as well, and Iliana warned us that if we saw similar mushrooms in the wild, not to eat them since they are poisonous. This dessert, like many of the courses preceding it, reminded me of a miniature fantasy landscape that little Candyland fairies might play in. Yeah, Iliana managed to make the "chocolate soil" dish--seemingly a requisite at all modernist fine dining restaurant these days--interesting for once. 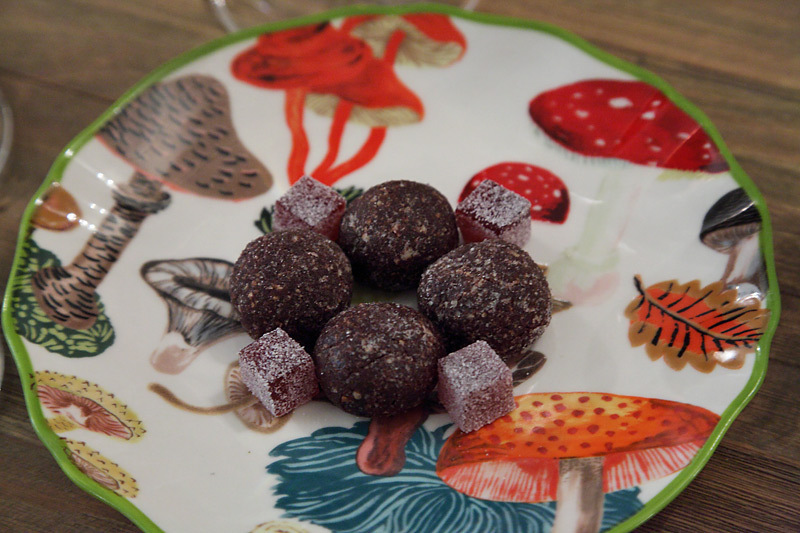 Also, does anyone know where to source the candy cap mushrooms locally? I had a candy cap mushroom ice cream sandwich at a San Francisco restaurant not long ago, that I would really like to replicate, it was one of the most amazing things I ever ate. We get the candy caps we use are dried. As far as I've found, they do not grow in the Midwest. I believe they are a west coast mushroom. I've only heard of local restaurants obtaining them dried (then re-hydrating them). Rare Tea Cellar has them locally, but there are multiple other non-local companies offering them dried . . . insanely expensive (though I plan on generously incorporating them into a dish or two at this year's picnic). Thanks for the tips, I did not know that Rare Tea Cellar sold mushrooms. And yes, $200 per pound is pretty expensive! 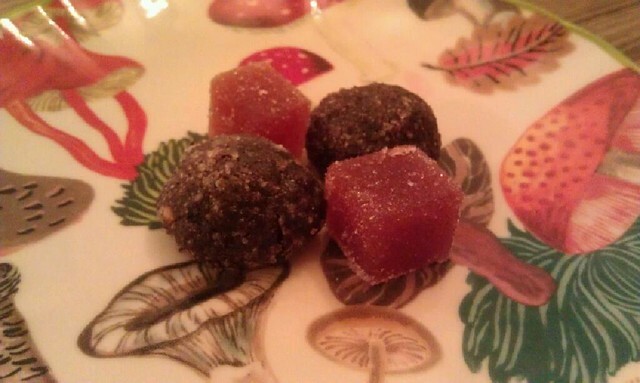 I did hear in a foraging class that because their flavor is so intense that you only have to use a very small amount. I hope I can remember until September that I really want to taste BR's dish at the picnic! And to try to get to Elizabeth soon also. I'm checking out Elizabeth for the first time in the near future and was wondering, in light of the new summer menu, if anyone had an opinion on the state of the wine program? I know I won't be ordering a full flight due to my budget, so any insights on the by-the-glass offerings and the quality of the sommelier's recommendations would be much appreciated! You can do a short pour version of the pairings or we have wines by the glass or bottle. It's up to you. The wines by glass and bottle are reasonable for budget. There are no rules. I made it to Elizabeth a couple days ago and I thoroughly enjoyed the experience. The layout of the room is very casual and really invites you to peek into the kitchen. It also underscores just how much effort goes into the experience. I was blown away by the ambition and tenacity of the kitchen. The meal lasted a little over 5 hours (I counted 20 courses) and the kitchen barely comes up for air the entire time. For those who commented on the value proposition earlier, I felt the current menu was a tremendous value (I was able to snag $85 dollar tickets at 6:15PM on a Tuesday). They really go all out and the passion is extremely evident. This was up there with the best meals I've had in the city and certainly nothing has even approached this level of ambition since my first trip to Alinea (which cost over twice as much). From what I understand, this is the third week of the new format. The room was mostly two tops with a couple four tops. I appreciate the change. Though I'm a gregarious guy and did chat quite a bit with the table next to me, my dining partner and I got to catch up and talk about the food without worrying about other people at the table being put off or feeling left out. At this price point (and length) the communal seating is kind of stressful. I'm pleased Iliana took the feedback and I think the restaurant is better for it. Also, the pacing of the meal was quite good and we never felt ignored or forgotten. This is quite impressive given the number of courses and the size of the kitchen. On to the food. The menu is split into four sections: the farm (vegetables and eggs), ponds, lakes, and seas (seafood), the woodlands (game and mushrooms), and dessert. I'll only talk about my favorites though I enjoyed nearly every dish. The first course featured a wonderful tomato tea that managed to harness all the umami potential of a tomato into an owl-shape cup of delicious tea. It was fun to contrast this with the mushroom tea that came later, that wasn't as meaty or intense though still tasty in its own right. I was certain the tomato tea had some meat stock in it, but I was assured it didn't. The steak tartare (from Schlegel farms) was served with a variety of beans (pickled and blanched) and zucchini preparations. 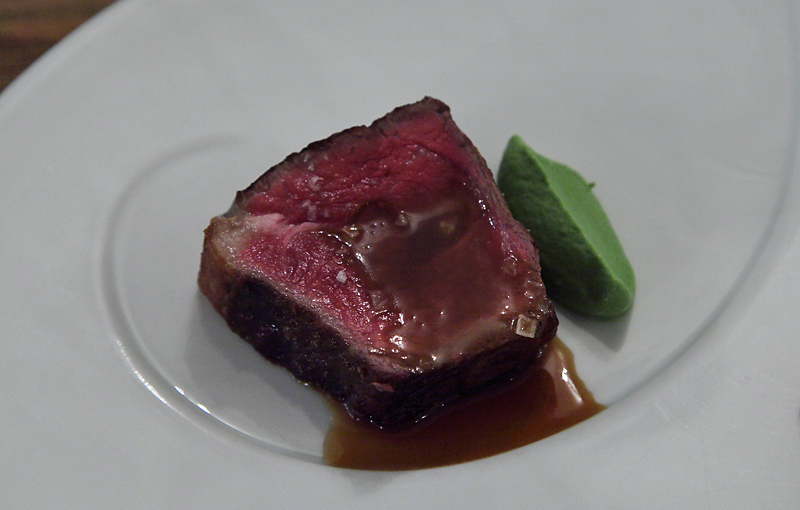 The steak was quite tasty and meshed well with the creamy zucchini and bright, crunchy beans. Truly this was a vegetable preparation that used raw beef as an accent. Very cool. The sturgeon and cucumber was a play on tzatziki that I thought worked very well (except for the bites where the mint overpowered). As was typical of a number of dishes, each bite delivered a slightly different combination of flavors and textures that each blended together in a unique way. The dish had a yogurt powder on it that was quite sour and really popped next to the smokey sturgeon. 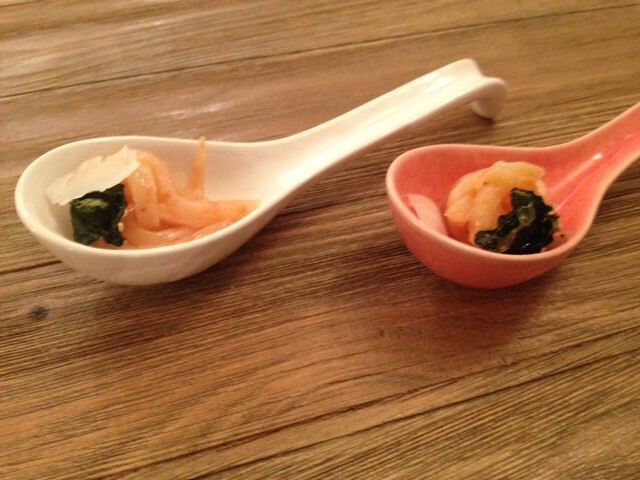 The shrimp noodle had a pleasantly sweet flavor that was accented by crispy kale and parmesan. I appreciated the creamier seafood preparation since it's such a departion from typical seafood dishes. The noodles had great texture and delivered the seafood flavor in a way that worked with the cheese, something you don't often see. 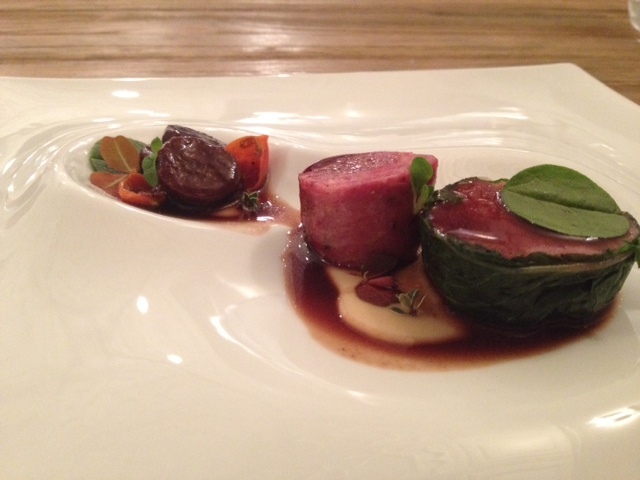 The show piece was the hunters stew that featured a number of different venison preparations. I particularly enjoyed the sausage that was quite funky (it must have had some organs in it) and really worked with the creamy gravy. Also the plate had a small but intensely flavorful carrot that was a terrific textural contrast that held up to the gamey flavors on the plate. I even enjoyed the desserts which were quite savory and small. I'm not a big dessert person and often I find myself turned off by the long string of desserts that cap off a long meal at a fine dining restaurant. 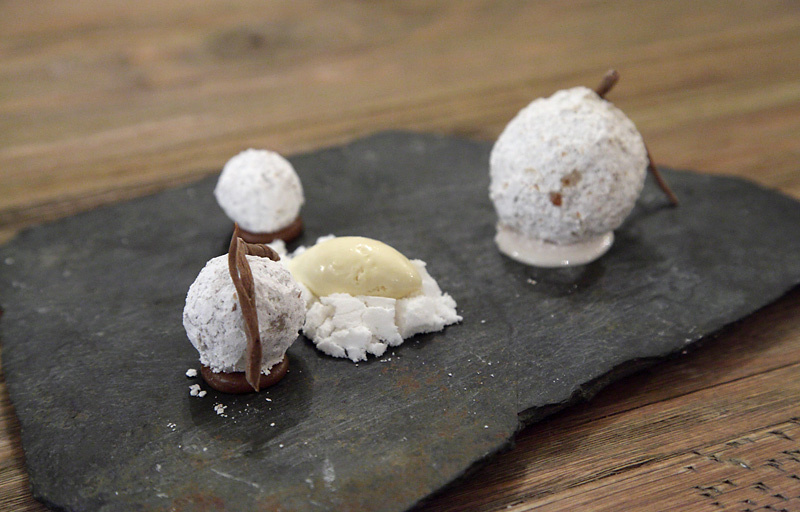 They served us two simple yet satisfying desserts that wrapped up the meal nicely. I didn't read much about the restaurant before I went so I was pleasantly surprised many times throughout the meal. They are working hard to deliver an ambitious and creative meal that really captures the essence of mid-western cuisine. I'm excited to return when they switch to the Fall menu. OK, in the immortal word of Lil Jon: let's go. I dined with turkob on Tuesday. I had done little reading about this restaurant. I used to get One Sister emails, but never have eaten Chef Regan's food. I haven't really paid much attention to this thread. I didn't what the tickets cost. I had no idea that they had moved to a single menu. So I was completely unencumbered with knowledge of the history of the restaurant since its opening LTHForum or public reception, price, or any idea of what was to come. This was one fantastic meal. 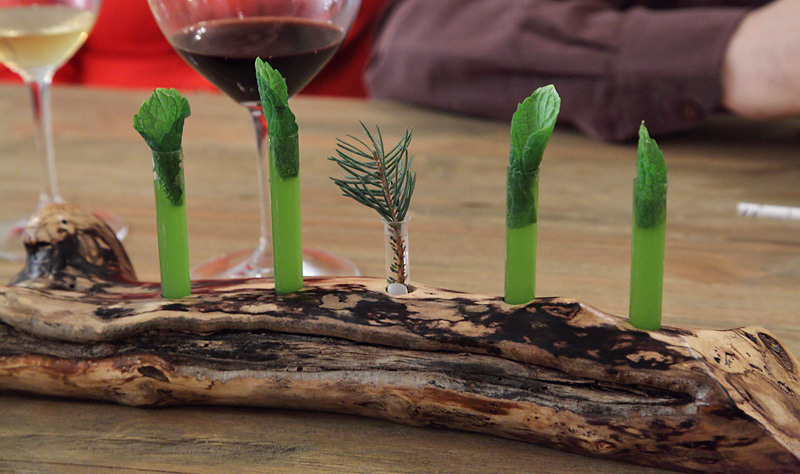 I don't think I've had meal showcasing this much creativity and precision since the first time I dined at Alinea. You can take my comments with a grain of salt as I do not dine often at this price point or with elaborate tasting menus. Due to these lack of qualifications, I am not really going to make any more direct comparisons between Alinea and Elizabeth, other than this one: the wows started early. I'm going off of no notes and only some pictures from the Facebook page, so please forgive a few inaccuracies. 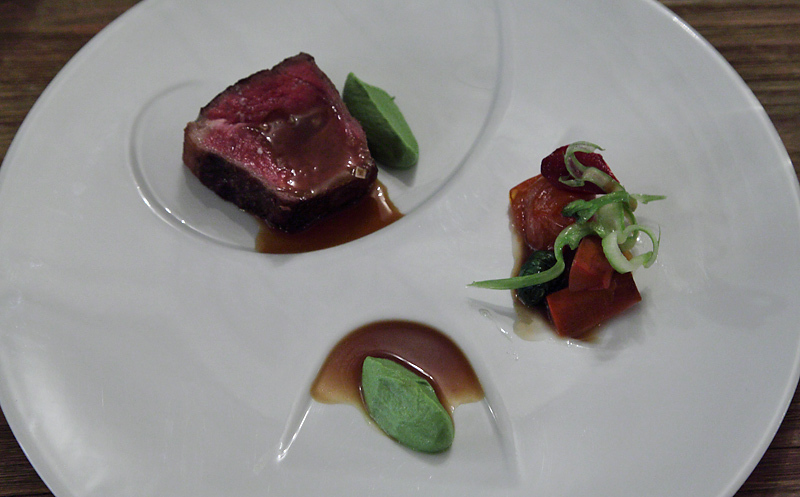 The first dish featured a trio of tomato preparations. One was a liquid tomato that was encased in a solidified core that tasted a bit too waxy for me. But the other two preps shone. One was a simple combination of fresh tomato and burrata. But the one that widened my eyes was the tomato tea described by turkob above. 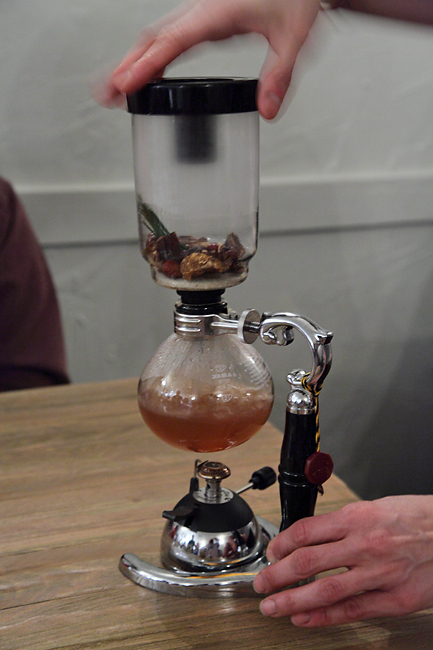 They served it in a vacuum coffee press where they infused the broth briefly with lemon thyme. 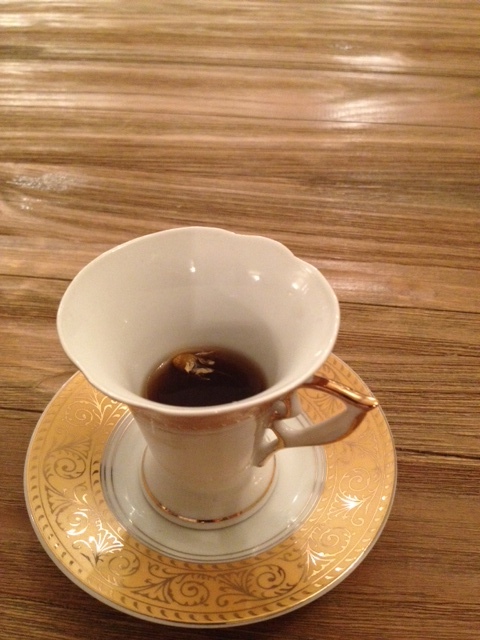 I didn't taste the herb, but a tea with such a depth of flavor that neither of us could believe it didn't have meat. It was redolent of my favorite summer fruit and cumin. The very essence of a meaty tomato. As turkob posted above, the tartarte was just delicious and lightened up by the inventive use of sea beans alongside fresh zucchini and zucchini puree. Throughout the night, the menu showed a deft and versatile hand with seasonal vegetables - something I can really appreciate. Like many dishes to come, this was an inventive pairing with enough components that both blended harmoniously but also allowed you to taste flavors with different combinations and textures with each forkful. There was a duo of corn dishes, both very good. My favorite of the two was the whole wheat biscuit with oven-dried tomato was delicious served alongside the fresh corn soup. I don't think the biscuit and soup were very easily eaten together and the honey on the plate was superfluous, but these quibbles underscore how much I loved that light whole wheat biscuit and the tomato topping and the corn soup separately. The very fact that Elizabeth can produce a delicious light whole wheat biscuit at all suggests how much care and precision goes into the preparation. I'm not biscuit maker, but I do bake a fair bit and I imagine this was a component with a high degree of difficulty and they pulled it off flawlessly. The Farm portion of the menu rounded out with the hen and egg which featured an absolute knockout chicken thigh gallantine (I believe - I can't remember which form or charcuterie this was). Once the soft cooked (quail's?) egg was spread, it might have been a tad undersalted, but I think this is often a tricky dish to get right given the small proportions and the completely unseasoned egg. 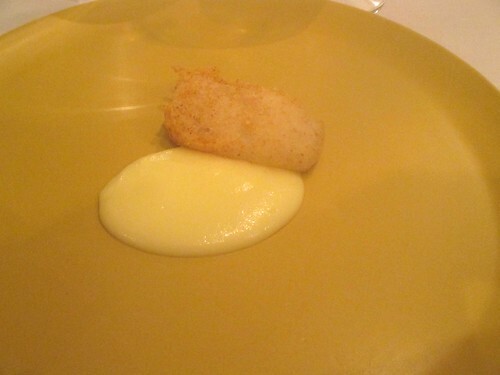 I frankly thought that this was the end of the meal - that's how ignorant I was of the restaurant's current format. Even to this point, I was highly impressed. Then they put on a show. The sturgeon and cucumber was another playground of texture and flavor. I agree the tiny mint leaves were a bit strong, but the combination of the house-cured sturgeon and the yogurt and buttermilk powders with the cucumbers was a wonderful crunch, smokey, tart combination of tastes. I loved the shrimp noodles. They were toothsome but very shrimpy and highlighted brilliantly by the crispy kale. I don't often think much of crispy kale - I like kale in many forms and this often seems a way to make it palatable to people who don't. But the texture here added to the dish. I thought the richness of the parmiggiana detracted a bit from the combination of shrimp and kale. I ate it separately. Maybe a thinner shaving of parm would not have been as overpowering. The twigs course featured a truffled whipped potato that even turkob, who does not love this type of potato prep, could not get enough. 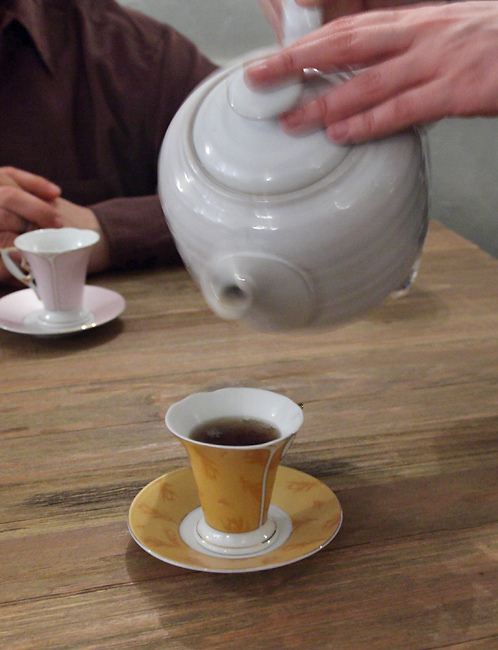 The mushroom tea with cocoa nib was also delicious - though it paled in comparison to the tomato tea we'd enjoyed earlier. The hunter's stew featured a trio of venison including a perfectly cooked bacon-wrapped loin, the funky venison sausage, and (I believe) heart. In addition to the chanterelles, it did feature two perfectly cooked and intensely flavored vegetables. The carrot was sweet and earthy. Essential carrot. I might have loved the cippolini onion even more. These were tiny bites but showcased top notch produce and perfect execution. All the flavors married well - and I didn't even get to describing the sauce. The cheese course had a quite savory pink peppercorn marscapone alongside a delightful arrangement of honeydew, melon gel, and Queen Anne's lace filled profiteroles. The melon's interplay with the profiteroles was fantastic. 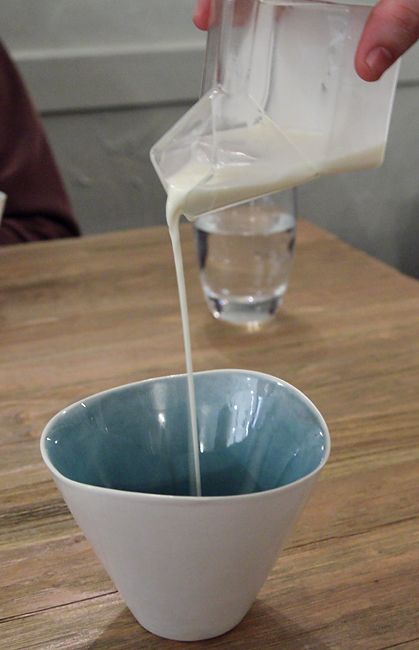 I was really impressed by the precision and sophistication of the dishes we were presented. I'll be the first to admit that I can be an opinionated diner (not an opinionated about diner) and I certainly could make suggestions on how I might tweak some of the dishes. But I was really taken with the creativity in flavor pairings, the execution of even complementary components, and a focus on flavor. Even the take-home thumb print cookie was a perfect texture. I guess people had been commenting on the value proposition. There is no question that I think it is worth the price of admission. I really don't want to end this write-up by evaluating it on the basis of cost. So I will say that there was sophistication on the plate but no stuffiness in the room. The service was fun and friendly. Watching the open kitchen plate some of the more elaborate dishes was fascinating. Some of them seemed to take 20 minutes from start to finish. They managed pacing very well for what turned into a 5 hour affair. So I came a stranger, but I left a fan. I really enjoyed Chef Regan's cooking. I can't evaluate the previous menu format, but this one seems to hold a lot of promise. I look forward to seeing what she will deliver in seasons to come. "Who remembers One Sister pierogi? Who wants to buy them? All natural local ingredients, sold by the dozen. 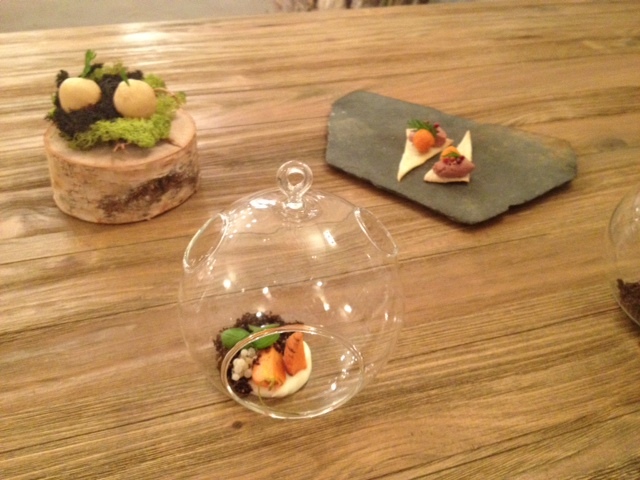 3 flavors: Elotes, braised lamb, and potato with truffle. Email info@elizabeth-restaurant.com to place your order for pick up on Saturday August 31st between 12 and 2pm"
Last week I dined at Elizabeth restaurant. A wonderful meal. Refreshing originality of a chef with more than just outstanding cooking sense, but a vision that ties together the entire eating experience, from the decor to the ingredients, presentation, and final courses. I'll let the pictures do the talking here. 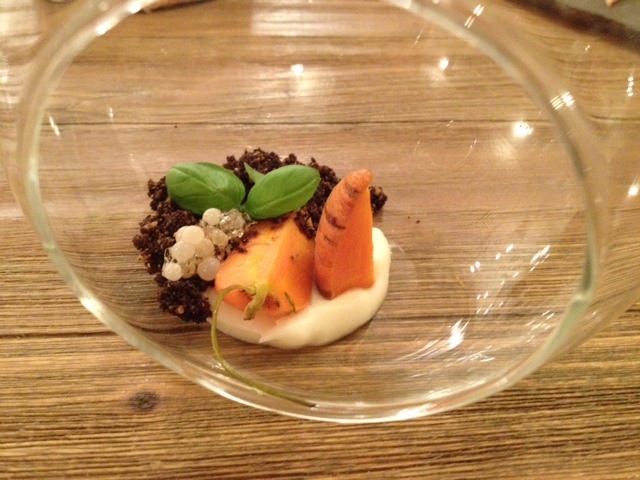 Carrot Appetizers; Drink, Eat, Chew, Terrarium. Chew. This was a hard shell (coco butter?) that burst in the mouth with carrot juice inside. 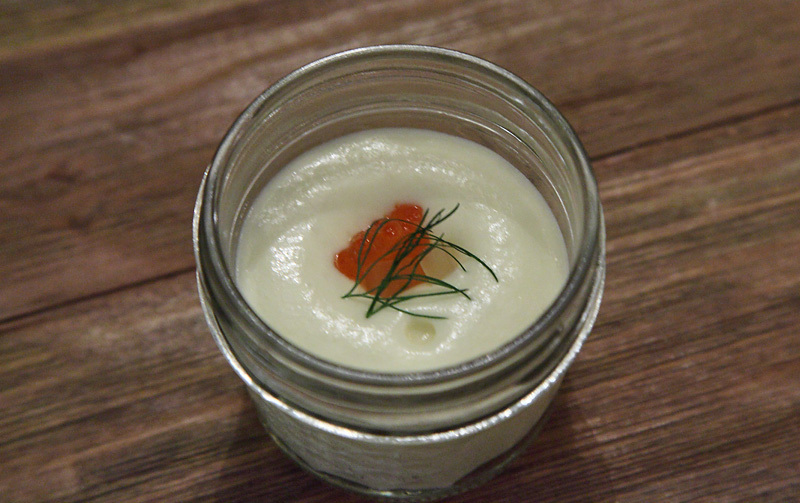 Potato with Trout Roe. 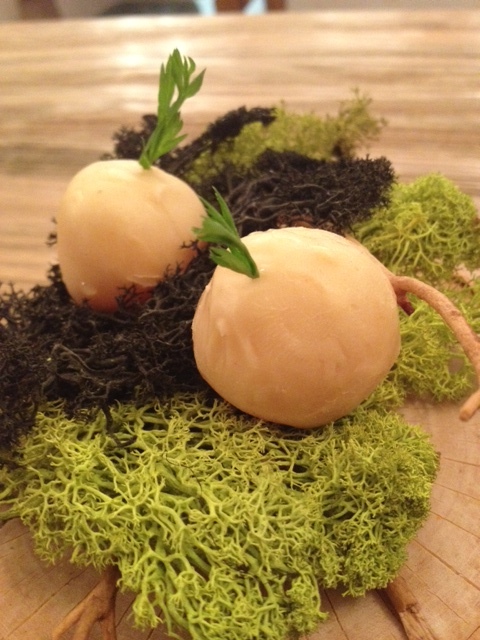 Potato whipped with salty roe to balance the richness. Shrimp Noodle. Its been said before, but these noodles are delicious. Just enough to leave you wanting more. 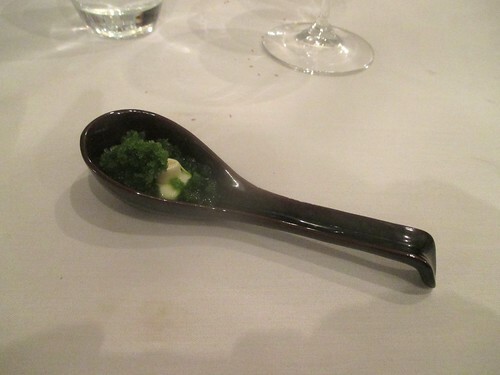 Perfect tasting menu portion. Mushroom Broth. Such an intense roasted mushroom flavor. 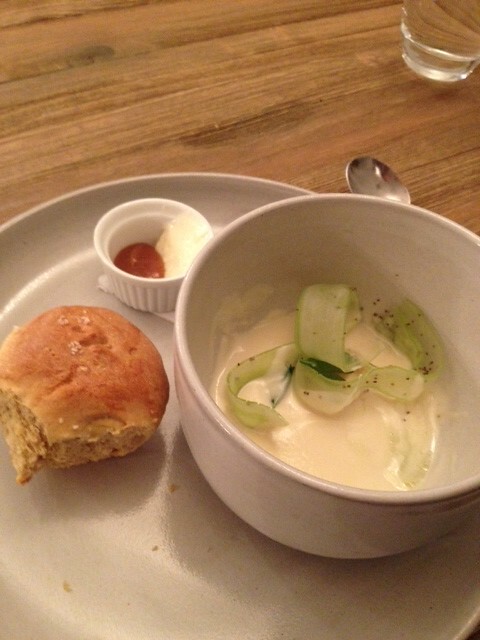 Bread and Celery Soup. This was one of my favorite courses. I was already half way through before I remembered to snap a photo. 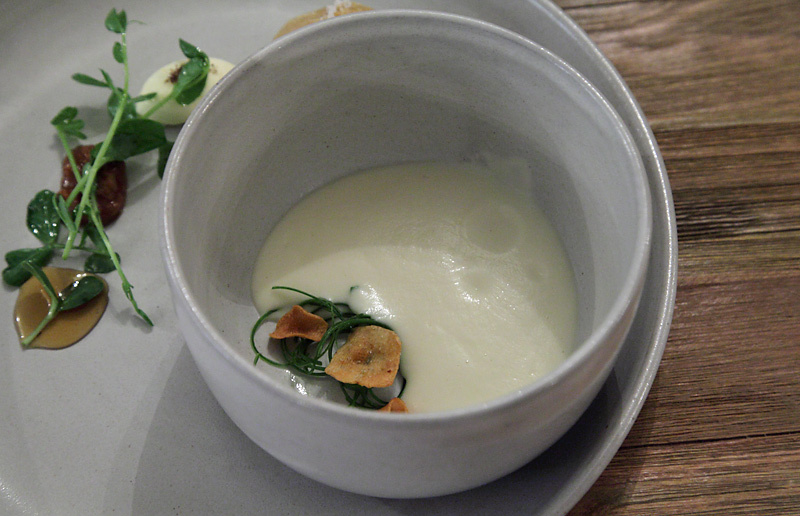 The soup included balls of celery root cooked sous-vide if I recall correctly. Roll was an interesting balance of crunchy outside and soft inside. To spead on the roll was a bacon butter that was addictive. Woodland Mushroom. Coated in panko bread crumb and ground acorn. Big juicy meaty maitake mushroom. Fruit Loops. A little on the sweet side. In fact, this could easily be a good dessert course. Each fruit loop color was a distinct flavor. The brown ones were my favorite - earl grey tea. 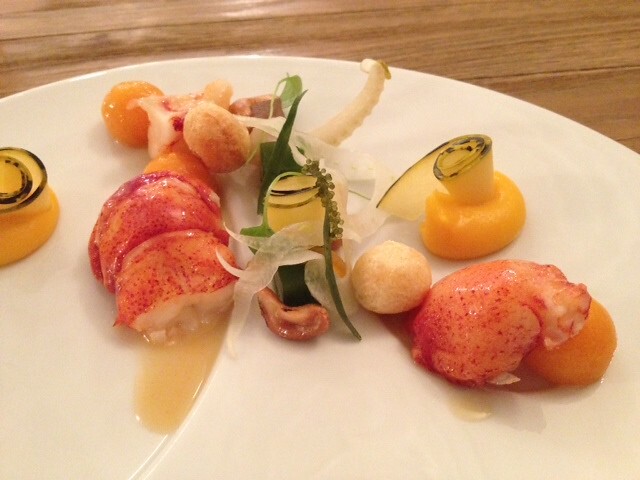 Lobster, Tarragon, Butternut, and Cashew. Pine Mushrooms in Bone Broth. Mushrooms hand gathered by Illiana. Lamb bone broth. But what really surpised me here was the intense flavor of the purple potato. Acorn Gnocchi, Sausage, with Forest Berries. The gnocchi are the little discs on far left. Test Tube of Queen Anne's Lace. Very clever presentation, but really not much more than some sweetish jello the had to be slurped out with a straw. 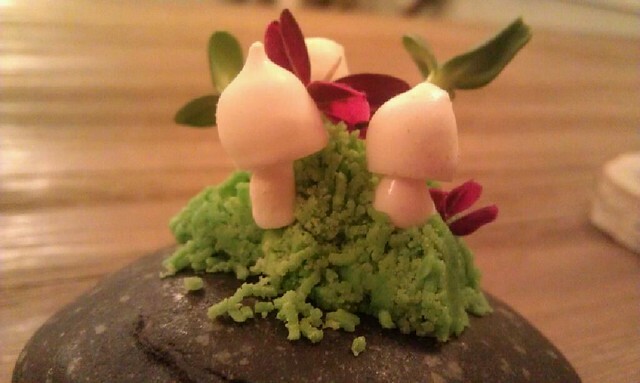 Parsley Moss, mini Mushrooms, Home Grown Garnish on rocks. The little woodland scene on the stone reminded me of something out of Dr. Seuss. 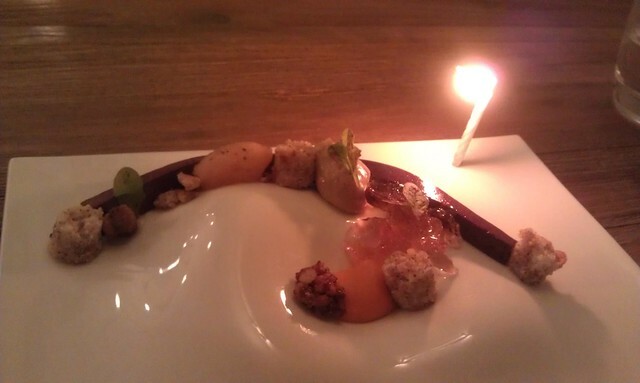 But like the previous dessert dish, the flavors were muted beyond a light sweetness. Sassafrass, Elderberry and Egg Yolk dessert of Trees and Autum Colors. Candle (for my wife's birthday) made problems for the phone's camera, but you get the idea. Bites. Unfortunately did not have a chance to taste. Brought them home to my in-laws, but reports where very posititve. A final shot of Illiana hard at work. Last edited by wak on November 13th, 2013, 7:57 am, edited 1 time in total. Any word on the alcohol program? I heard rumors they would be doing cocktails. Any beer available? My wife isn't that interested in wine. Our meal was very similar to what wak posted, only a few dishes were different. Loved the meal. If I was being overly critical I'd say the deserts weren't as good as the other parts of the meal, but I'd chalk that up to being the other sections of the meal being THAT good. My wife is a pescotarian and as far as tasting menus go, she thought this was one of the best and this is the only place that has printed her a separate menu as well. We loved the atmosphere. Pacing was good, but we still had a 4.5 hour meal. Probably more by our choice, lots of talking and quite a bit of bathroom breaks. I'll answer my own question in case people want to know. We had the option of sparking or still water, which is nice. I greatly prefer sparkling with a meal like this. Water served was Pellegrino. I got a full wine pairing for $100. The couple I was with had no problem splitting a pairing. My wife had the four cocktails on the menus, which were in the $10-15 range. Quite a bargain. All were quite nice and fresh tasting. Eight or so beers were available as well, nothing too interesting but all should pair decent with the meal. The wine pairing were pretty spot on. The sommelier appeared to be a former Next employee, I could be wrong on that. Great experience overall. I'd post pictures but wak seems to have most of the meal covered. Will be going back in the spring if I can get a bargain table again, think we got ours for $85 per seat. I went late last month, my first time there since the end of communal tables and also since the departure of the sous chef Wilson, who had been there from the beginning. I think since his departure Iliana has gone back to her roots and abandoned some of the modernistic elements that Wilson introduced. I think this is a good development as it allows Iliana to showcase the distinctiveness of her cooking. And also I admittedly disliked some of the more modernistic elements. And now that there is no more communal dining, everyone seemed more relaxed. Man, I have been meaning to come here after multiple awesome Three Sisters meals. But it's just the perfect storm of expensive, long and too far away from home. The sitter alone entails a hefty premium. Vitesse98 wrote: Man, I have been meaning to come here after multiple awesome Three Sisters meals. But it's just the perfect storm of expensive, long and too far away from home. The sitter alone entails a hefty premium. If you are able to get in on a weeknight at an early time there often are some great deals (often in the $75 to $85 range and you still receive the full menu). 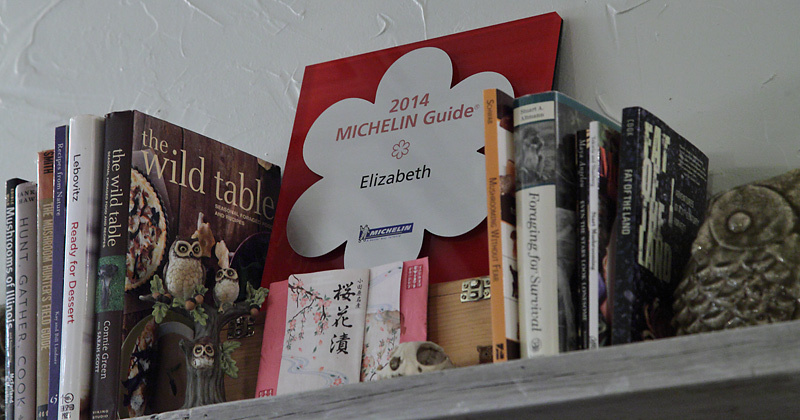 I dined at Elizabeth last week and had a fantastic time and outstanding dinner. Chef Regan continues to become a little better with each subsequent visit and has a great staff around her (our primary server was new and came over from Next where he had been for most of Next's existence). Hopefully you are able to make it in soon; IMHO it is well worth it and one of the best and most unique dining experiences in Chicago. Crap, I meant One Sister. Anyway, weeknight is like the fourth factor of the apocalypse. We have to deal with not just distance and duration, but work schedules, too, which unfortunately hampers whatever cost savings we might gain. To get to Lincoln Square on a weekday from Oak Park, during rush hour, is a drag. Regardless, I think Iliana is truly inspired. Just ate some of her frozen pierogi, in fact. I made it back to Elizabeth last night and Chef Regan continues to become better and better; really a fantastic all around dinner with several memorable courses and extremely friendly service. 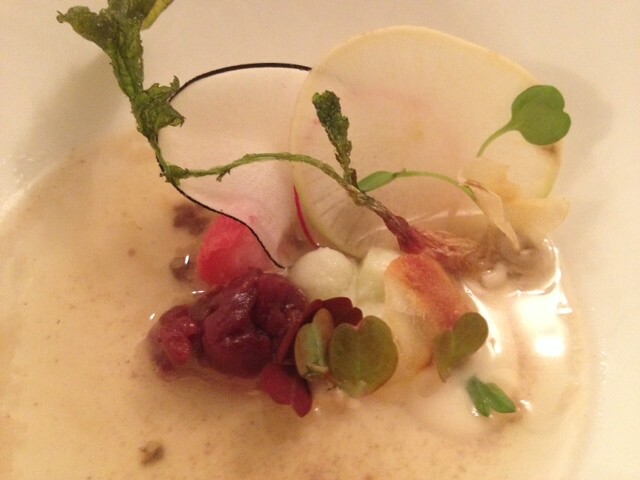 The winter menu extends through the end of this month, but she is already starting to introduce some spring courses. One of the best courses was a trout accompanied by foraged goods she obtained from the West coast including my first fiddleheads of the season. 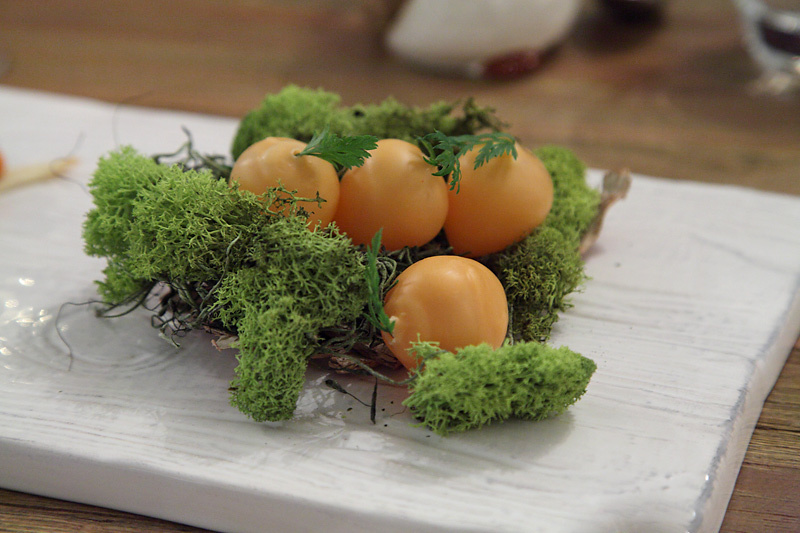 Such a nice symbol that spring is almost here (even though it sure has not felt like it of late) and the flavors of this course were outstanding and the presentation stunning. The steak course (rib-eye) was among the best beef I have consumed; nothing too fancy with this course, but perfect texture and immensely flavorful. 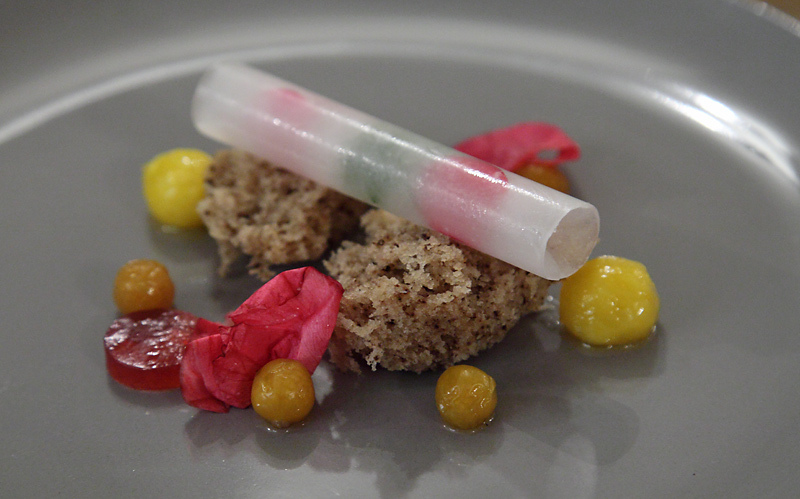 I also loved the cereal course - what looks like fruit loops but the loops are made of scallop, mushroom and strawberry. The Elizabeth signatures were phenomenal (a trio of signature courses that unlike the rest of the menu do not change with the seasons); my favorite being the chicken fried mushroom (and the shrimp noodle a close second). 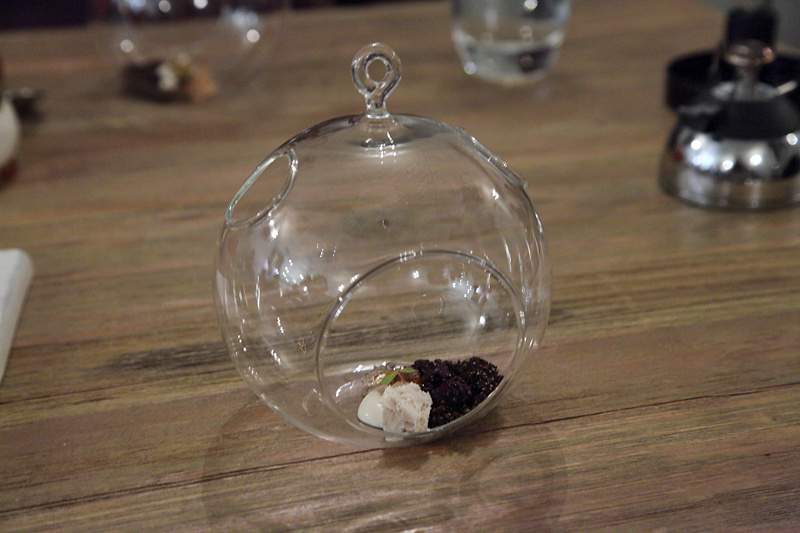 The whipped potato course with caviar was also outstanding as was the very first bite (spiced liquid carrot inside a cocoa nib shell). This is definitely the heartiest menu I have had at Elizabeth; nice mixture of one biters and more substantial courses. I definitely left with a full belly. My only complaint food wise involved the aggressive use of vinegar in many courses (both myself and one of my dining companions last night are averse to foods with strong vinegar odor or taste). 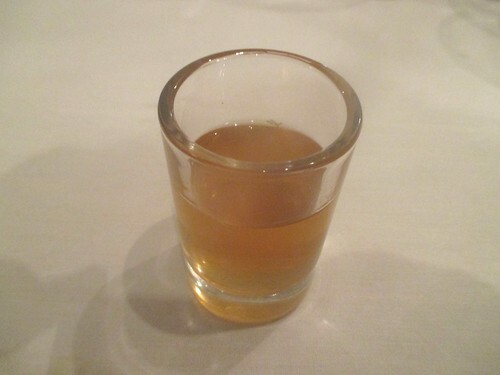 While I was expecting this to be prominent in some components of the savories (since I knew there would be a lot of preserved fruits and vegetables on the winter menu), I was surprised that vinegar was prominent in both desserts and even one of the final bites. If you dine at Elizabeth on a weeknight it is truly one of the best values in fine dining - and it is the best value in fine dining if you obtain one of her even further discounted tickets she sometimes posts about on Facebook/Twitter. I do feel the wine pairing is a bit on the pricey side (have done it on a couple of previous occasions) so we opted to order two bottles of wine for the table which worked out well (the wines by the bottle seemed quite reasonable and our table loved both of the wines). There also are some outstanding teas available and I ordered one of these with desserts. They do have some limited wines by the glass available, but they do not have a list for this; I do wish they had a wine-by-the-glass list available as we may have opted for this over bottles but I like to see what is available and know prices. If you have not dined at Elizabeth in recent months I think you will be pleasantly surprised with the overall improvements that have been made. 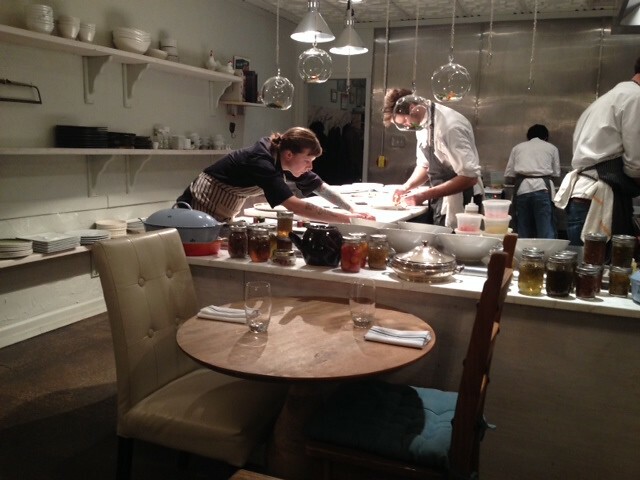 The ambiance and pacing is so much nicer now that tables are individual rather than communal (our meal was just over three hours) and Chef Regan has elevated her game; really an impressive and memorable dinner. I am already eagerly anticipating my return for the upcoming spring menu. My dinner last night was one of the best meals I have had during the last several months. About three weeks after my most recent meal at Elizabeth, I was having dinner at Rainbow Thai. The meal at Elizabeth had been a profoundly memorable one. I'd been thinking about it repeatedly since the night it took place. However, as much as I had been remembering it -- and wanting to come here and write about it -- I was stuck. Where to even begin? Days passed. The meal clearly warranted something more than my standard pictorial recap. Yes, there were pictures but they didn't effectively tell the story the way they do with a great majority of the meals about which I report. This was fundamentally different. Ingredients were distinctive and of superior quality. Compositions were innovative. Preparations were flawless. But there was so much more to it than that. Being just a few yards south from where that meal had taken place was stirring it all up again. I'd been carrying this unfinished task around with me for nearly three weeks. Savoring it. During that time, memories of specific courses, pairings and moments would materialize and drip away slowly. How could I recapitulate this meal in a way that accurately communicated the distinct emotional effect it had on me? Well, quite frankly, I wasn't sure that I could. And I'm still not sure that I can. In fact, I'm fairly certain that I cannot. I step out of Rainbow Thai into the bitter cold and cautiously navigate my way over a three foot high shelf of slippery, iced-over snow between the sidewalk and the street to grab a bottle out of my car. Success! Bottle in hand, as I turn back around to re-enter the restaurant, standing right there next to me is none other than chef/owner of Elizabeth, Iliana Regan. She's out in the frigid cold, the only coat she's wearing is her chef's coat (with an apron over that). We chat a bit and I ask her what she's doing out there. She tells me that she's got some diners in the restaurant and the cabs that have been called for them haven't shown up. So, she's going down the corner of Western and Lawrence to flag some cabs for them. Hmm . 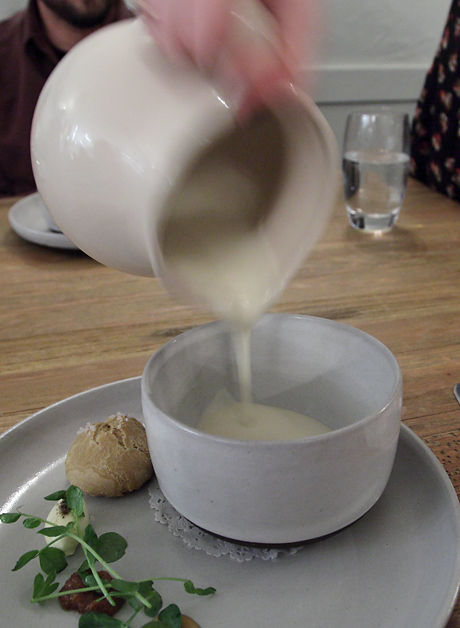 . . perhaps the story of this meal at Elizabeth should begin here -- three weeks after it actually took place. No chef I know puts more of herself into her restaurant than Ms. Regan. Don't get me wrong. I know and admire a lot of chefs. And I'm familiar with a small handful of them who operate at this level. But it's rare. The best of them work as long and hard -- through a variety of unpleasant, challenging and hazardous conditions -- as just about anyone. They do this for ridiculously low pay. They're typically away from their families and loved ones while we 'civilians' are with ours. Many toil in obscurity. It's largely a thankless job. And the sole reward for many of those who break through the obscurity is that they land in plain view, constantly in the public eye. From that small group, a tiny percentage find recognition, glory, fame and maybe financial security. If you walk the path of a chef, you'd better do it for the love of the journey because in so many cases, that journey is the only reward to be had. And sometimes that journey -- and the unending desire to make people happy -- takes you through frigid cold, down to the corner to hail a couple of cabs. The menu we experienced that night at Elizabeth was the table of contents for the narrative that is Ms. Regan's Philosophy Of Life. Or, at least her passions. Our meal was a journey. Admirably, she puts herself out there, takes a ton of risks and probably never regrets that she held anything back. The food tells a specific story and it's a dramatic one. It's liberating and exhilarating to experience the work of someone operating from this aesthetic. It converts the act of dining into something entirely different and takes the diner to new territory. On this night, I felt like we were privy to something extraordinarily personal. This course (not yet on the menu at the time of our meal) was a set of delectable, bite-sized charcuterie items that were actually paired with some terrific house-made brioche. 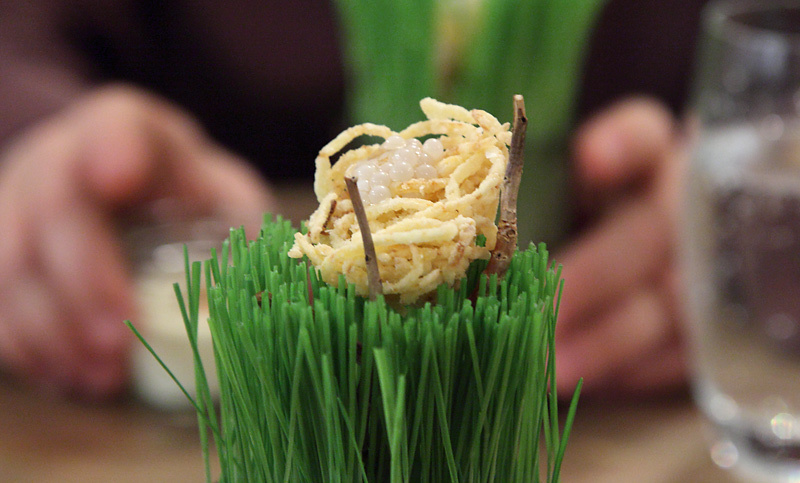 This included roe from snails that had only ever eaten basil. 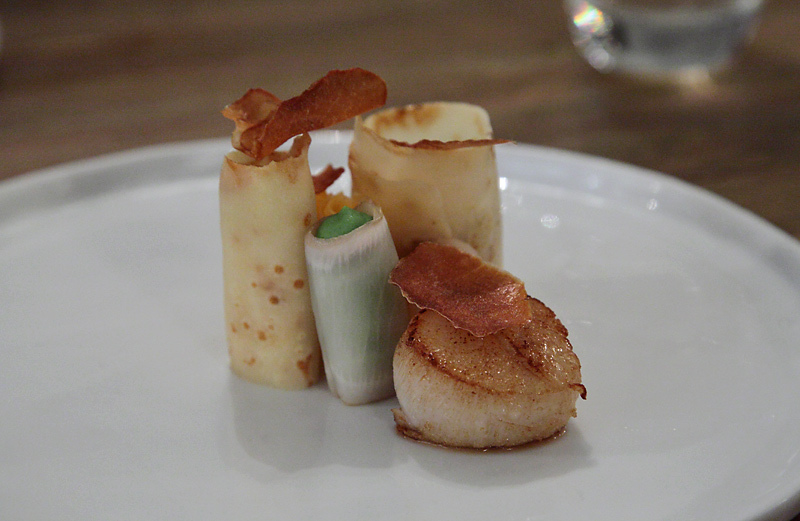 Many of the individual courses were sensational, though I cannot say I loved each and every one of them. However, in the context of the overall meal, that doesn't matter much. Not every course can satisfy every palate. 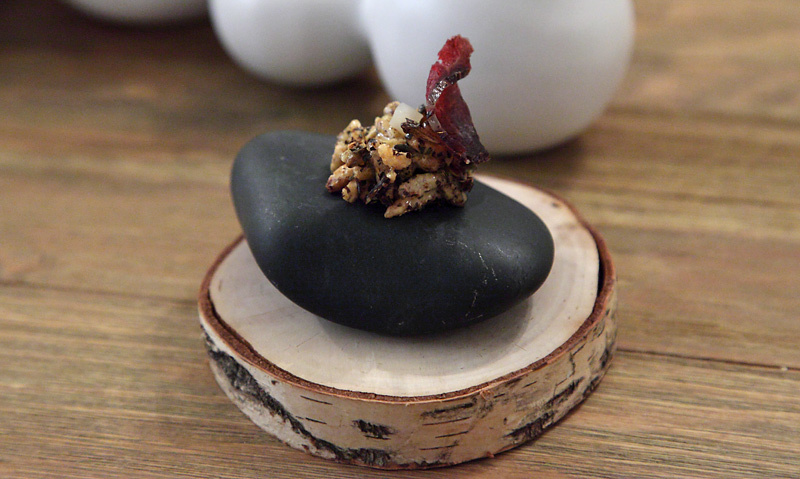 I've had so many tasting menus over the years and at some point, most of them just blur into each other. That was definitely not the case with this meal. Even now, weeks later, I remember all of it, including the pairings, which were exceptional. As I mentioned above, this was a dramatic narrative and the courses are as etched into my psyche as the paragraphs and chapters of a book might be. The meal was an inspiration on many levels but most of all, it reminded me of the value of taking risks and not compromising one's vision. If more restaurants were operated like Elizabeth, the world of dining would certainly be a more interesting and meaningful one. We just returned from a wedding in Chicago after a 10 year hiatus. The city looks better than ever and the dining is extraordinary. The weather for the most part was cold and rainy-I sure don't miss that but it brought back memories. 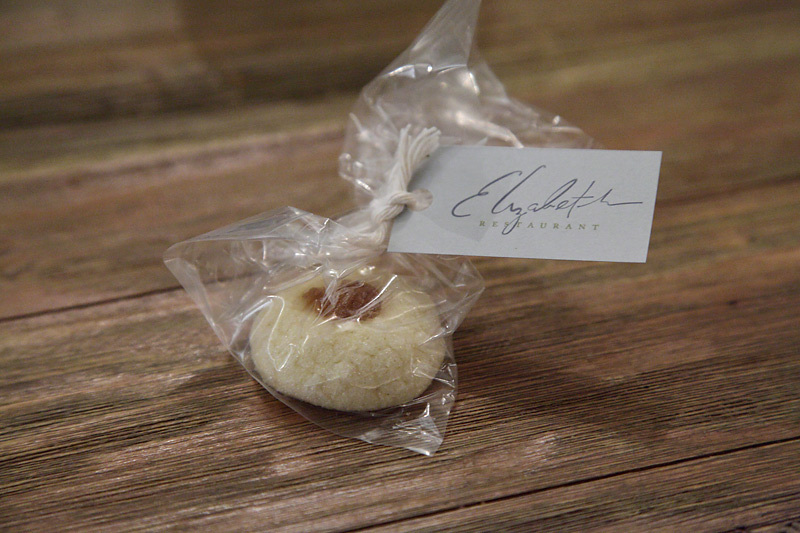 Our 1st dinner was at Elizabeth and it was an amazing experience, expecially at $100 for an 18 course extravaganza. Some courses were the same as Ronnie's previous post, including the centerpiece, the teas, terrarium, rock with bear, and shrimp noodles. No heart for us but we had luscious sweetbreads and another meat course of spring lamb. Chef Iliana's style reminds me of Coi in San Francisco, with inventive cuisine offering various textures and serving styles, without the molecular fuss. This place is a treasure. Our 2 other dinners were Mexique and a crawl between Publican and Girl and the Goat. We loved all 3. For lunch I thought Eataly was pretty impressive and had a bucatini amitriciana as good as any in Italy. I could live at Purple Pig and thought XOCO was another show of Rick Bayless' genius. Unfortunately I had no time or wheels to have my favorite dog at Superdawg or Italian Beef at Johnnie's but I was able to satsify my Jones for each at Mello's, near my old hi rise on Clark St.
My last meal was Pot Belly at Midway before heading home and I thought it's lost a bit since going public in a big way. Drats, should've had the corned beef at Mannie's. I don't think I want to wait another 10 years before visiting again. One of the challenges of progressive cuisine as artistic endeavor is that dishes demand to be loved. They snuggle up to diners, rarely stare them in the face or kick them in the shins. In contrast, contemporary art has a well-deserved reputation for such affronts. Provoking one’s clients has a long and respected history from Marcel Duchamp’s urinal to Andreas Serrano’s Piss Christ to Richard Serra’s brutal steel plates. These are objects that are important precisely because they insist on being unloved. Chef Iliana Regan, the wunderkind behind Elizabeth, has established what is surely one of Chicago’s half-dozen most essential restaurants; yet even Chef Regan does not create dishes that are “ugly, slimy, and bitter.” However, in her rare series of personally gathered compositions (served on occasional Tuesdays) she explores the boundaries of taste and texture. 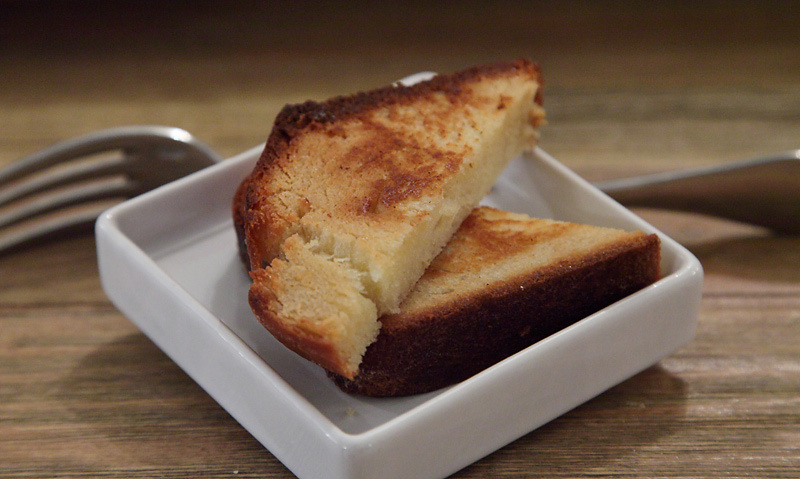 The dishes on Elizabeth daily menu are diner-friendly, despite their gathered ingredients. During this summer Chef Regan plans to visit important sites of gathered cuisine, such as Noma and Willows Inn (and Nathan Myhrvold’s molecular workstation in Seattle), and surely her vision will be shaped as a result. The dishes on Tuesday – at least the Tuesday that I attended – are more edgy than those on Saturday night, but more vital for creating a cuisine that doesn’t depend on diner-love. They are not unctuous or coarse, but neither are they syrupy comfort food. 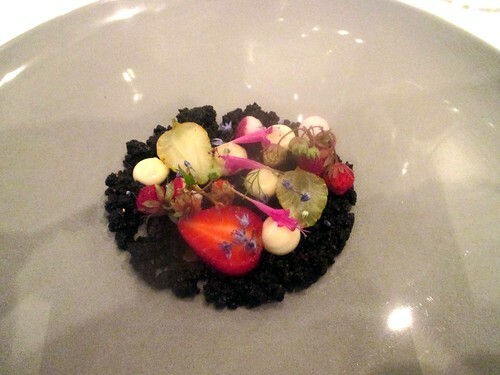 Dinner on Tuesday began with a composed dish of wild strawberries, baby radishes, allium flowers, hyssop, and hay pudding, placed atop malted barley soil. Malt soil is a common base for salads at Elizabeth, ground fine as a condiment. Tonight, however, the soil was rocky. 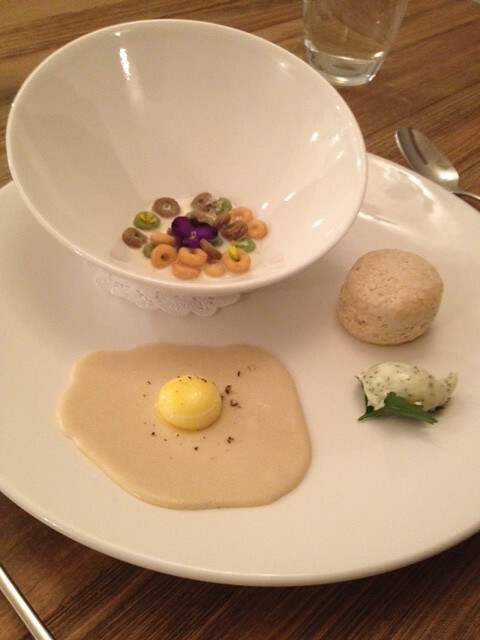 We were served barley pebbles, emphasizing the texture of the dish. Our attention was directed to the plate. 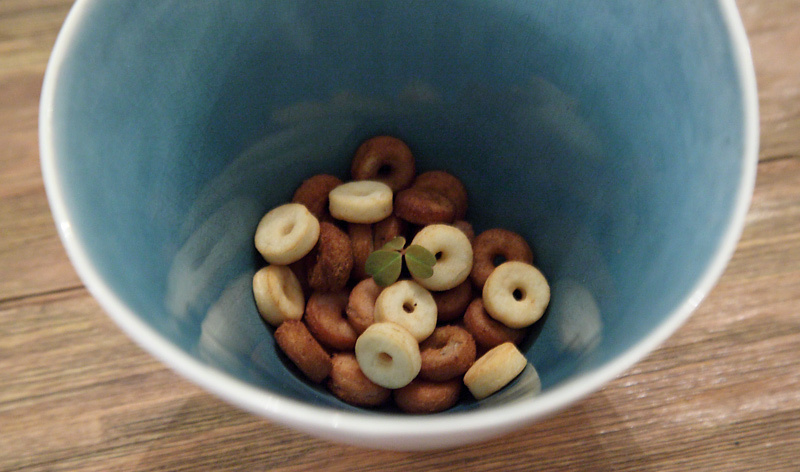 One could not eat the salad thoughtlessly, and whether one wished an easy mix, one received a rocky outgrowth on which radishes, allium, and wild strawberries survived. This starter was followed by a paean to skin: crispy salmon skin sous-vide, served with sunchokes, late-season ramps, and wild carrot pesto. Again one’s attention was focused on the ingredient: the animal as lived and killed. Perhaps the most important dish was the main salad: a bouquet of wild greens that lacked the buttery geniality of bibb: yarrow, chickweed, bok choy blossoms, and other peppery and bitter roughage. 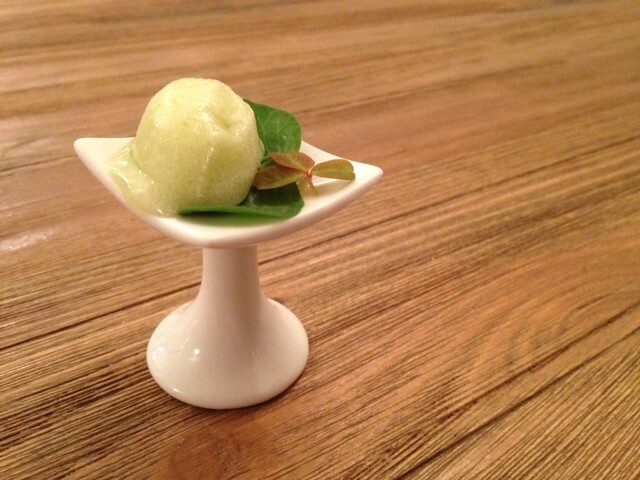 The plate was centered by a calm house-made whey sorbet, which provided a honeyed warmth to the unforgiving greens. It was a salad that demanded a new perspective on what greens can teach. 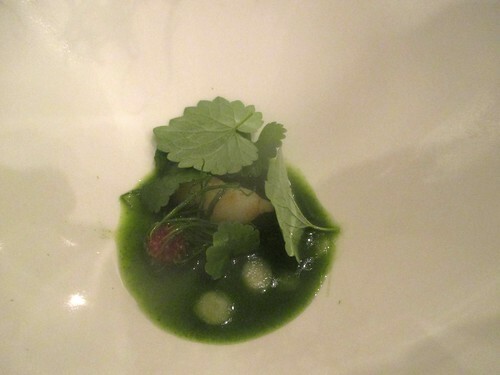 This salad was followed by a dish that provoked in its blazing minimalist simplicity. Chef Regan served a small piece of bluegill, blanketed in tempura batter, perched on a puddle of creamy potato: beige on beige. 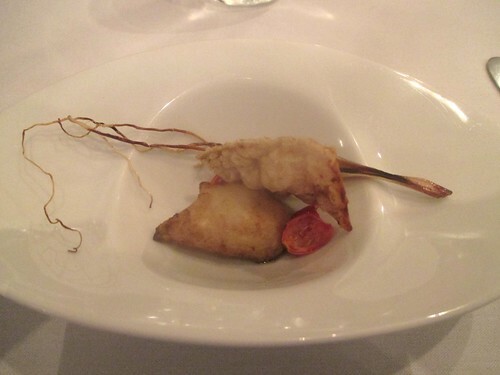 With the attempts by other chefs to create a blow-your-horn dramatic cuisine, this dish hid in plain sight. But each half was so delicately perfect that a diner was reminded that all that mattered was taste and texture. In its lack of glamour the bluegill was most profound. It was pure sensory delight: no sound and fury. 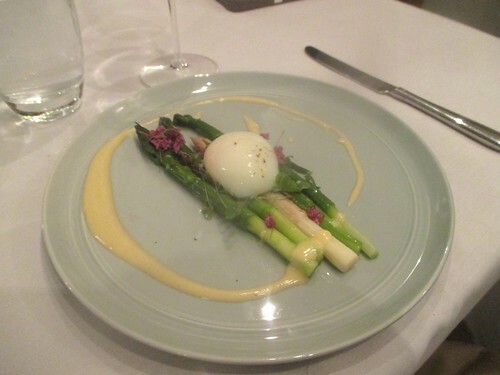 I was less impressed by the asparagus, Hollandaise and 64 degree (Celsius) egg (and wood sorrel), which traded in current cliché. Even the plating seemed conventional. Nothing wrong with the combination, but little that one wouldn’t find in common boites throughout the metropolis. Ordinary brunch. 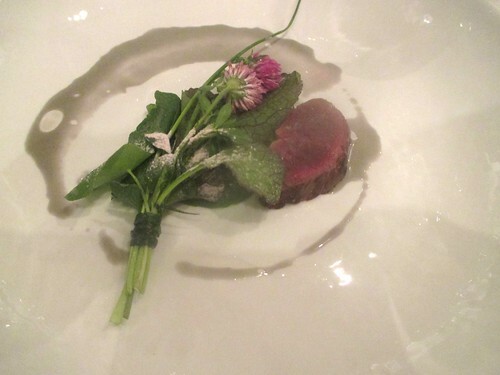 The deer loin, on the next plate, was gloriously veiled by a bouquet of crow’s garlic, clover flower, and powder of red vinegar. While the protein is typically the main player, Iliana’s loin was hidden in a forest glade. The deer was bloody delightful: undercooked and kicking, but it was the gathered tastes of the wild that made this Noma-esque dish inspiring. 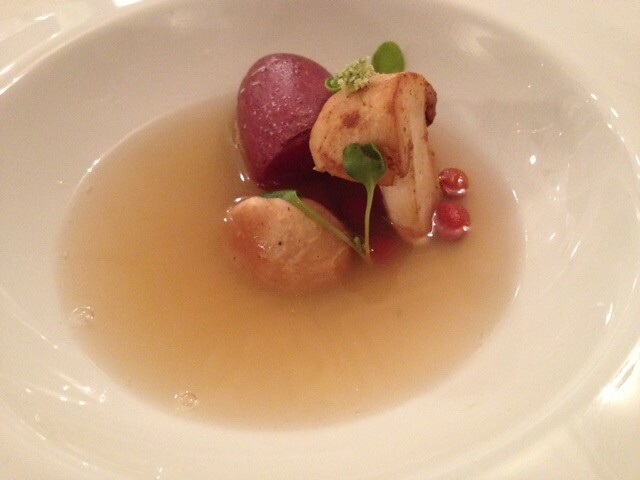 Course seven is another gathered scene: a wooded pool. 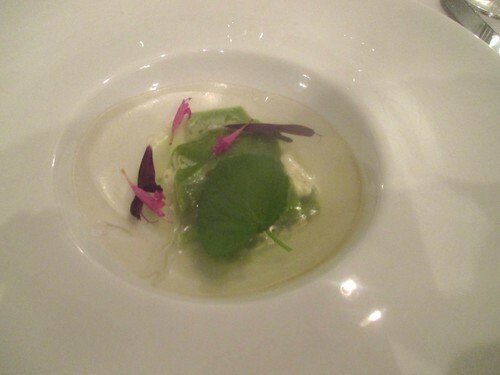 Chef Regan served wild onion, braised daylily, and electric green sassafras leaf (providing a gelatinous and startling texture). Daylily bulbs provide a unique and sweet crunch. 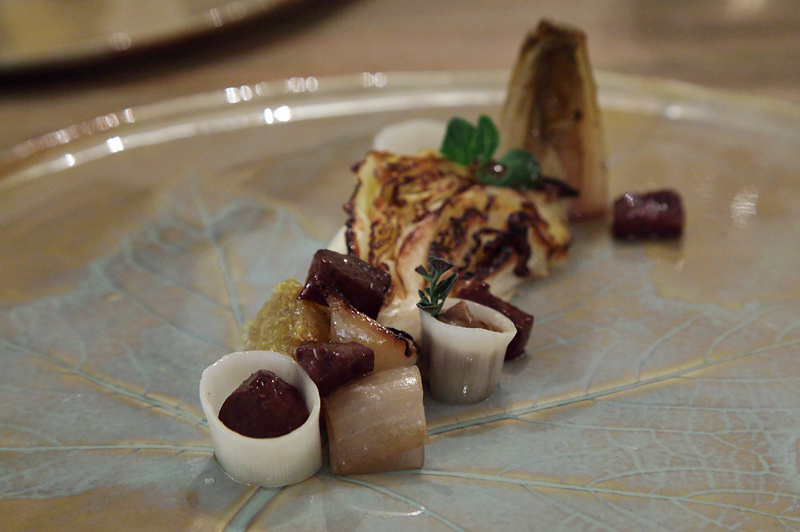 This dish, more than most others had a New Nordic quality: Gastrinavia. Bright colors, dramatic vegetal flavors, and unexplored textures abound. 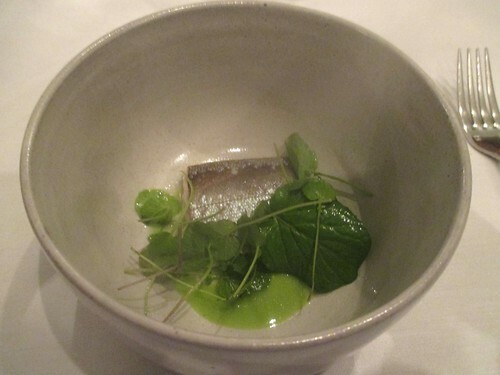 Lake trout in a salad of watercress, cattails, and milkweed was introduced by the chef, challenging us, “It tastes like Lake Michigan smells, which is not necessarily are bad thing.” Not at all. Here was her inverted parallel to the fried bluegill. Another simple dish, but with starch replaced by greens, and frying oil, but light heat. Excellent. 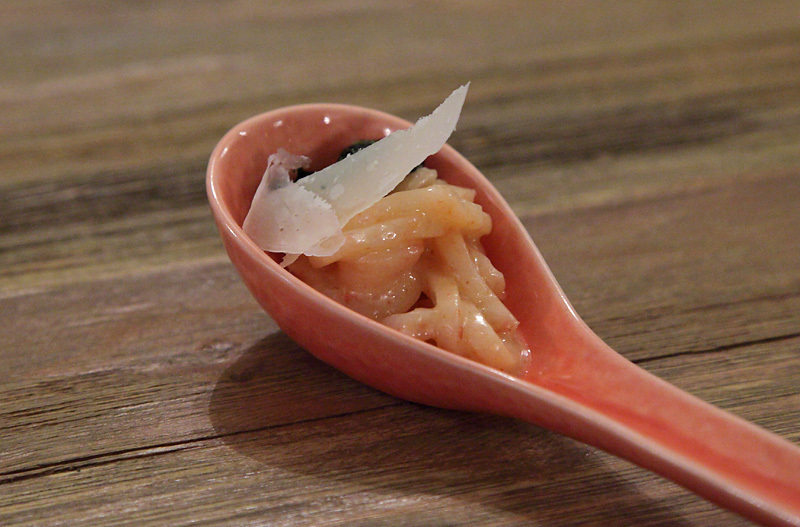 The ninth course was a transparent, transcendent “pasta”, and perhaps the best construction of the night. This pasta was sited in an overgrown garden: salvia, hyssop, cicely, pokeweed in a pheasant broth with house-made ricotta. This dish underlined the trust that we give our chefs. What might cicely, much less pokeweed, do to my innards? Carrots have a long history, but hyssop? Some weeds are “bad actors.” Do salvias save? As naïve diners we hope that chefs, like medicine men, do no harm with their physics. 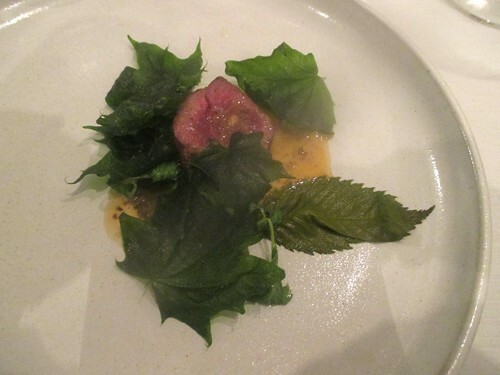 Plate ten was our major protein: Canadian goose breast with morels in butter, pickled elm leaves (elm leaves? ), fried maple leaves (maple leaves?). One is shaken by eating the forest floor. The maple leaves prove that everything is delicious if it is fried. 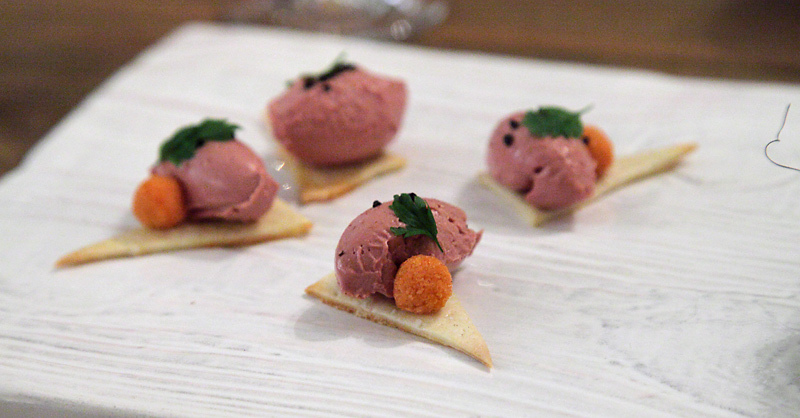 This is another dish that demonstrates just how thoughtful and how poetic gathered cuisine can be, and why Chef Regan is among the leaders of this movement. Iliana is known for her libations: typically mushroom tea. 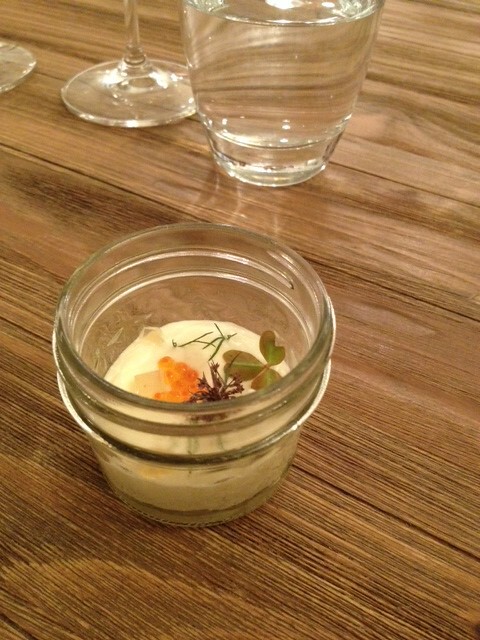 Tonight we were served a shot of chamomile, German thyme, and pepper along with a dollop of spruce ice cream. The shot was not entirely diner-friendly, but distinctive as refresher, and the ice cream kept us in the forest depths. 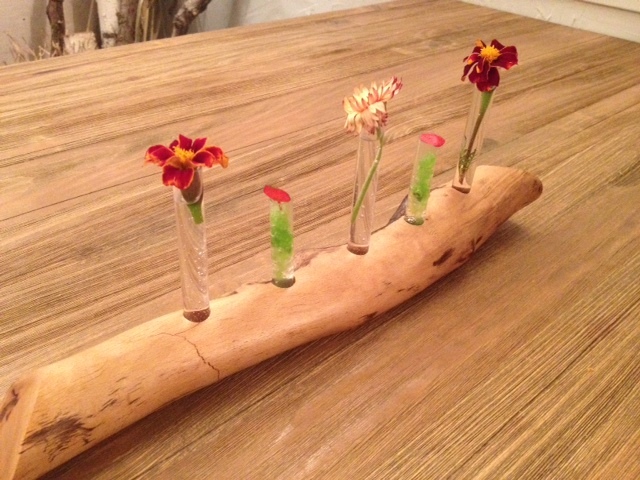 The sweet spoon was a reprise of previous ingredients, daylily shoot, cattails, and chamomile pudding. Short and vegetally sweet. A minor, if carefully plotted, taste. 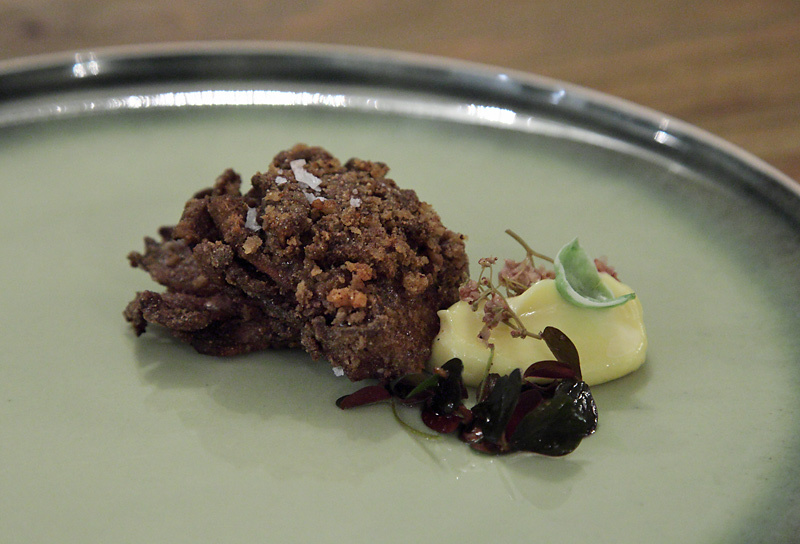 The main dessert revealed was both perfumed and untamed: cicely ice cream, lamb quarters, milkweed, and sassafras root. Eschewing the traditional frostings and sugars, this dessert demonstrated that a wild meal can be honeyed. 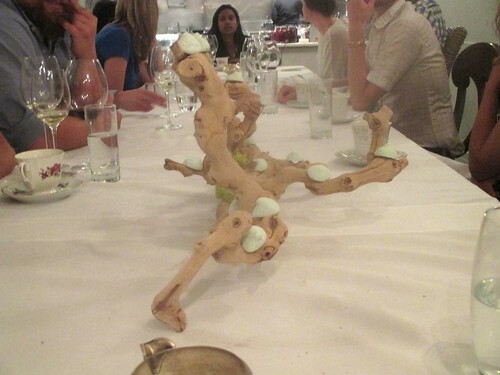 A mint marshmallow smuggled onto a driftwood centerpiece ended the night with peace and pleasure. As Elizabeth is becoming more proficient as a restaurant, it requires a laboratory in which experiments can be tested on willing white mice. As much as I appreciate what is served on Saturday night, Tuesday evening may be the more important. Yes, some of the flavors and textures require tolerance, but this was the most influential meal I have had in Chicago since the early, glory, molecular months of Alinea and Avenues and moto. A new culinary day is upon us: a dawn appreciated in a dappled dell. GAF, thank you for attending and your commentary. The next solely gathered dinners are on July 15th and 29th. Hope to see some of you at Elizabeth. As we grow stronger as a team and restaurant I like to push us away from the familiar or what's expected of tasting menus. So as we continue to focus more on ingredients I source and gather, our diners may discover new tastes and textures and that's what dining is all about. Though the great thing is that it's from ingredients that are all around us. Our regular summer menu will, like our other menus, focus on local farmed, gardened, and gathered ingredients. Headed there with a friend tomorrow night. Any word on drink options? I am heading there tomorrow too. 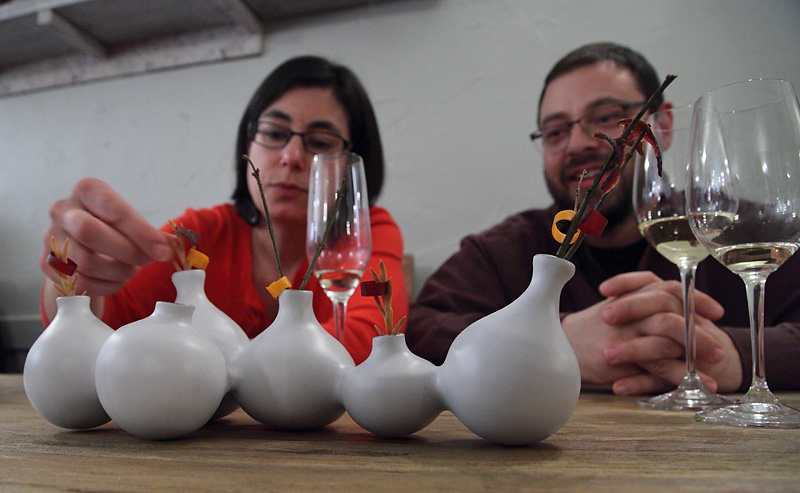 They offer wine pairing ($100) and recently started a non alcoholic pairing (I believe $40). They also have a selection of wines by the glass and bottle, recently started a cocktail program and have some excellent teas and coffee. We were there last week. They have a wine pairing ($100), a reduced (amount) wine pairing (I think $70), and wines by the glass and bottle as well as beer and the cocktails. We split a bottle of white and then split a glass of red to finish the heavier parts of the meal--which they graciously poured in two glasses for us. I don't have time to write a full review, but the menu is very interesting--diving further into gathered foods, many of which have subtle flavors. I've been before and went to One Sister back in the day and was a different experience. I'm still kind of processing it. Also, they're now offering "upgrades" of things like cheese courses and caviar. I found it a little odd--I don't know what to think of these kinds of upgrades with the ticketing system. It's a very different way to plan dining out and I think the tickets help the diner plan expenses as well as the kitchen. Anyway-we passed and had a great dinner and experience. Have fun this week. I returned to Elizabeth a little over a month ago myself on somewhat of a whim. I felt bad taking so long to return...it was September of '13 that I had last been in - and I should have went sooner. Just under two years later, things are so different than the early days of the restaurant. It's hard to believe it has been almost two years. I enjoyed the three opening menus. 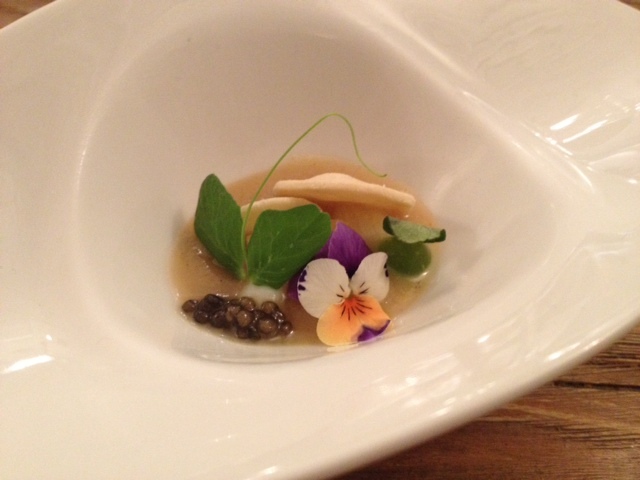 My Diamond menu experience in Feb of '13 was in my top 3 meals that year. But, I think the condensing and shift to 1 menu allows the kitchen to better focus and better perfect the 14-18 courses on the one, single, sole menu. This is, from just a diner's perspective, perhaps the most significant change. Chef has also been able to expand a little, and gather more talent for her kitchen - it seemed much busier behind the pass, closer to a more traditional kitchen structure than meals I had before (two folks on the stove, one preparing cold dishes and plating, another working pastries, etc). The night I was in Chef was doing some serving and clearing herself, which was a pleasant surprise. She has some great help, faces that I recognize from other well-respected restaurants in town. They have a solid team there at the restaurant! As for food, everything was most importantly delicious, with various touches of fun and surprise intertwined throughout. Of course not absent are other true Elizabeth touches like interesting garnishes, ingredients, and hand-picked foraged/gathered bounties of the local earth. I think that as time has gone on, the balance best of classic flavor vs. foraged/gathered ingredients vs. modernist techniques, that is approachable by most diners has been perfected. This meal is also just so much fun, in like a French Laundry Salmon Cornets way or Coffee and Donuts way. There are just so many fun and cute little touches that throw you back to childhood - like the house made Apple Jacks/Fruit Loops dessert. I must admit that I'm a sucker for the childhood influence. It's entertaining and fun-- and that's what makes dining out so enjoyable sometimes. This breaks down the borders between the chef and the diner, which is inherently important... People get nervous and intimidated by these kinds of dinners sometimes. I can make dinner for myself at home. I don't need to dine out. So when I do, it's always nice to have something fun and unique to remember and to evoke a childhood memory or something. It should be entertaining as well as sustaining. They are knocking that aspect out of the park. The midwest is a beautiful and bountiful region of our country; that is to be celebrated and revered and is certainly done so at Elizabeth. It is perhaps that no restaurant in Chicago so boldly display this better than Elizabeth. Go to the coasts and you can get great food showing off the regions... Lobster in the Northeast, beautiful vegetables and produce in California, but so few places in the Midwest do this. The Midwest is a chef's dream in many ways... Iliana Regan is one of the few people capturing that. I can't wait to go back for the summer menu. It promises to be fun and delicious and truly unique, creative cuisine. I couldn't agree more with Royal's comments about the evolution of Elizabeth; extremely well said. Tonight's meal was fantastic; best service I have experienced at Elizabeth and the food as usual was creative and delicious. I loved Chef Regan's new gadget; a smoker - this was utilized in three courses and the smoked beet in the vegetable course was amazing and the smoked chicken course was one of my favorites on the night. The housemade Green Goddess dressing in another vegetable course was phenomenal and I loved the smoked salmon spread with the bread course. As with my previous meal portions were generous; I left perfectly satisfied - pacing was the best I have seen with no lengthy gaps between courses or beverage service and this was also the best they did with making some tweaks for dietary aversions. Definitely a wonderful staff in place right now - both Front and Back of the house. Elizabeth is definitely the best value in fine dining in Chicago - especially if you snag some of the discounted tickets Chef posts about on Twitter/Facebook. Really an enjoyable evening.